« How to Choose the Right Leverage? Why is correlation important in trading? How to evaluate the correlation coefficient? How can these relations be applied in trading? If you have any questions or suggestions you are welcome to join our forum discussion about Correlations Within the Forex Market. Within the Forex market there is a certain relation between currencies that can be observed. Since currencies trade in pairs, they cannot be isolated from each other. In order to measure the strength of relation between currency pairs, a trader can use different statistical coefficients, as one of the most popular is correlation. For a trader, who uses a number of currency pairs on his/her account, it is extremely vital to know how these pairs relate to each other. If a trader focuses on one single pair, this might not be that important. If some currency pairs have a strong relation and move together, this means that a trader can be exposed to a significantly high risk, if he/she trades both pairs. Therefore, the correlation coefficient is a milestone in managing risk. First, we need quotes for a specific period of time on two different currency pairs. We can evaluate the correlation between daily charts for EUR/USD and GBP/USD for the period since September 1st 2013, for example. Quotes should regard the same time frame – daily EUR/USD to daily GBP/USD, weekly to weekly, etc. Second, we will use the build-in function CORREL in Excel in order to estimate the correlation coefficient during the period September 1st till October 31st. We see that the correlation between these two pairs is 0.8911 or 89.11%. This is a significant correlation. It is useful to mention that high positive values of correlation suggest that currency pairs move significantly in one and the same direction, while negative values close to -1 suggest that they move equally, but in opposite directions. If the correlation coefficient is close to 0, there is no relation between currency pairs and they move independently. Also, correlation coefficients will change, if we use different data array. In our example we use 2 months of data (from September 1st until October 31st), but if we use a 3-month array of data, we would certainly evaluate a different correlation coefficient. Correlation is usually presented in a correlation table or a matrix. First, let us see the correlation coefficients regarding one and the same time frame (2 months) and multiple currency pairs. We use daily quotes for all pairs. When crossing every column and row, we can observe the correlation coefficient for the corresponding pairs. If we cross EUR/USD and GBP/USD, we can see a coefficient of 0.8911. 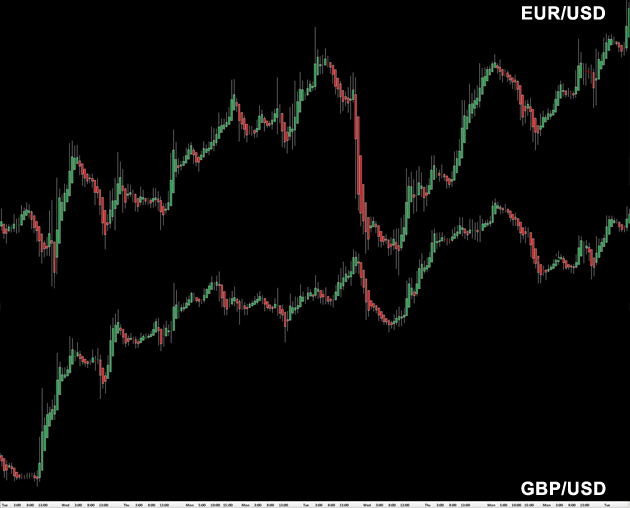 Since EUR/USD is related with itself, the correlation coefficient is 1. Additionally, EUR/USD to GBP/USD presents the same relation as GBP/USD to EUR/USD, thus their correlation coefficient is the same. Second, let us see the correlation coefficients regarding one currency pair, but different time frames. How can this be applied in trading? Here we are looking at 1-hour charts of EUR/USD and GBP/USD. They move quite simultaneously. Let’s suppose the following situation. A trader decides to open one position with EUR/USD and another one with GBP/USD, considering that it will be a diversification and a risk reducing move. However, this appears to be wrong, because the high correlation coefficient between the pairs suggests that adding GBP/USD will not provide the trader with any risk reduction. Entering the above mentioned positions will surely increase trader’s risk, because the EUR and the GBP very often move in one and the same direction. Since we have a correlation coefficient of 0.89, we can imagine it as a replacement of 1 lot of GBP/USD with 0.89 lot of EUR/USD. Opening 1 lot in EUR/USD and 1 lot in GBP/USD will appear to be equal to 1.89 lot of EUR/USD. This means that the trader almost doubled his risk exposure. 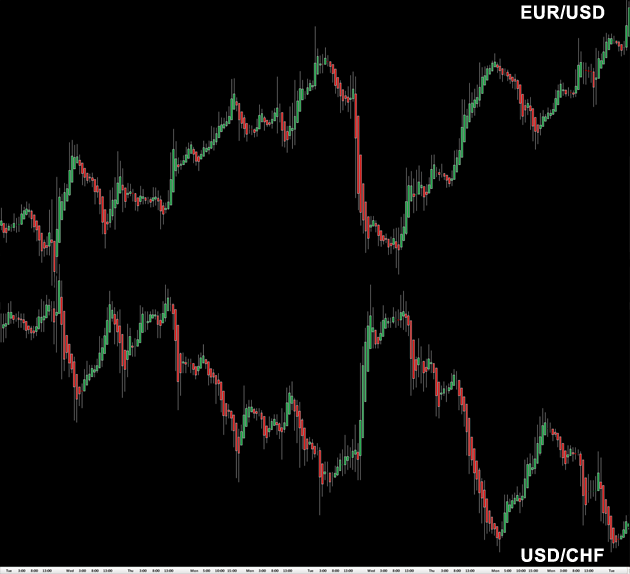 If a trader uses highly negatively correlated pairs (EUR/USD and USD/CHF, again 1-hour charts as shown below) and take opposite positions with them, this will appear to be the same as taking one-direction positions with highly positively correlated currency pairs. Or, if he enters a long position with EUR/USD and simultaneously a short position with USD/CHF, this will give him the same situation as entering a long position in EUR/USD and another long position in GBP/USD, or entering a long position with twice the size of EUR/USD.